In Episode 184 of MayaCast, Tom and Kip chat about the Merovingia Update and the July Releases for Infinity the Game before jumping into a recap of Chapter One of the Campaign: Paradiso that their local, Ben, has been running – including the alterations, the missions, and recaps of their games. Conversion Contest for MasterGlass Q2 ends in just over 3 weeks! 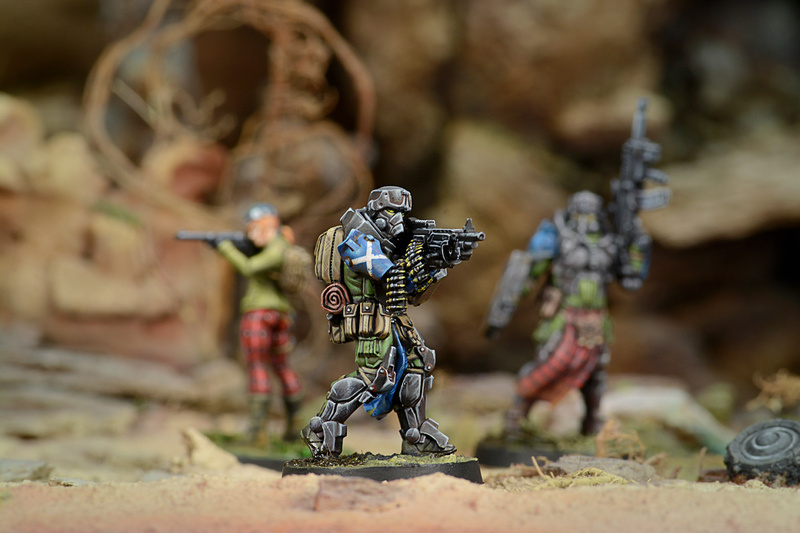 Today we have for you one of the upcoming May Releases for Infinity the Game – The Caledonian Mormaer with AP HMG! ” Dileas Gu Bas ” (Loyal until Death). Gaelic motto of the First Regiment of Caledonian Mormaers. In a society like the Caledonians, in which Teseum is the base of clan power, the ostentatious display of this neomaterial is a symbol of both political and military power. For that reason, the Mormaers are the elite of the Caledonian Army. Their armors contain an amount of such incredibly pure Teseum that it offers a protection superior to most of the body armor of the Sphere. The production cost for one of these suits of armor is so high that very few in Ariadna can afford to have it. And the same is true of their weapons, whose ammunition is worth a king’s ransom. It could be said that the Mormaers’ identity is based on Teseum. Because of this, the regimental name, an old noble Scottish title equivalent to Duke, derives from the fact that they are the distinguished elite of the Caledonian troops. Nothing is more prestigious for a clan than to be able to equip and to enlist one of its best men in the Mormaers. Because, in order to enlist in this regiment, the clan is obligated to contribute all of the necessary equipment, weapons, ammunition and supplies for each recruit. This implies a considerable investment in Teseum. For that reason, only the best soldiers of each clan are selected to become Mormaers, many of whom are the most prestigious members of the clan. This is the main reason why the regiment is formed of so many members of the clan elite, and why there are so many family and political ties among them, where few are called by their military rank, being more accustomed to the names “Sire” or “Cousin”. This is why it is said that the Mormaers are the aristocracy of the Caledonian Army. Nevertheless, In spite of being in a line of regiment always deployed when necessary to face exceptional conditions and situations requiring “Victory or Death”, their combat discipline and the quality of their equipment are so extraordinary that their casualty levels are very low, so that their elite identity always remains virtually intact. 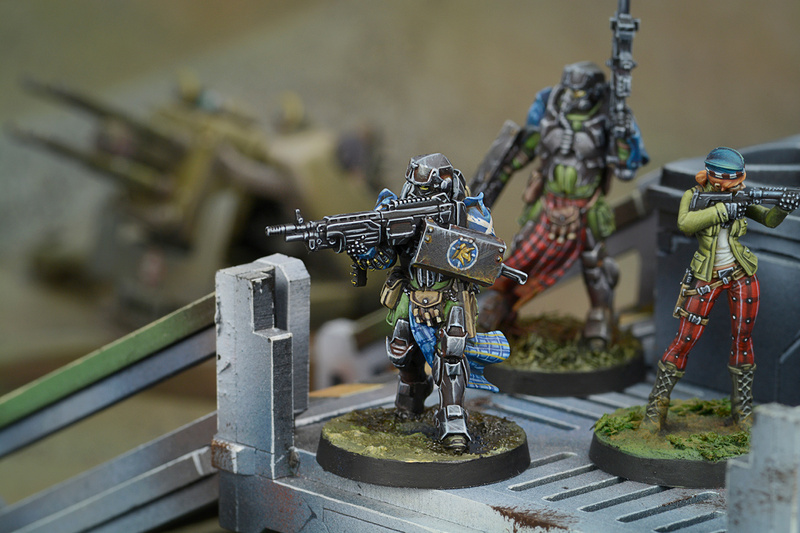 As complicated as the scenario may be, the Mormaers always impose their own terms, from the beginning to the end of the battle, where the vast superiority of their firepower gives them the first word, and also the last. 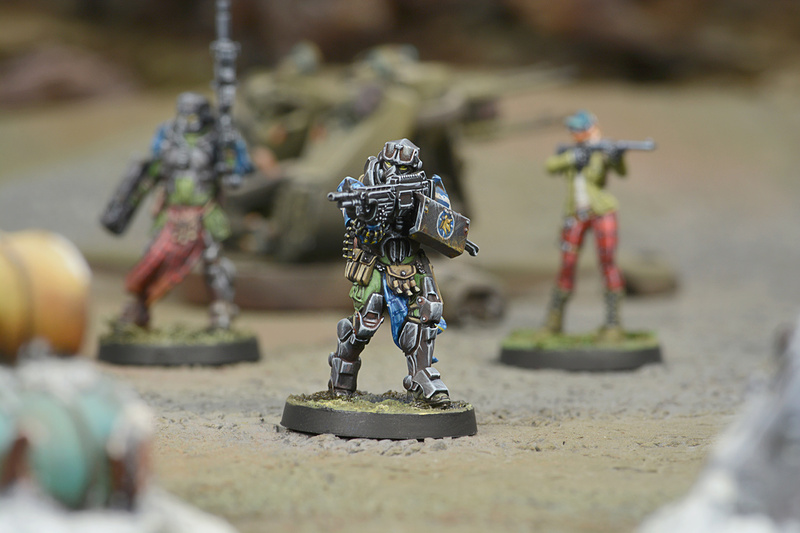 MayaCast is proud to show off this exclusive preview of the Nexus Operative of the Combined Army for Infinity the Game! For hundreds of years, the hills that descended from the Udhit Mountain were one of the prettiest, most peaceful places on that unknown planet. Generations of Urkherits enjoyed the splendor of a privileged, calm setting. It was a prosperous farming community that always respected its gods and worshipped them according to established practices, receiving clear blessings in return. Until one day, when their gods landed on the mountain peak and demanded a tithe of their best young men to accompany them to the stars and serve them there. These young men would learn new things and discover marvelous places. Every season this happened. The ship arrived and the Urkherits offered them a tithe. Brave young men that would never see their home again because all who left to serve in the stars never returned. Even though they were scared to death, all of these young men took up the call because they knew their people depended on them to maintain the happiness and lifestyle of their community. These fortunate heroes were envied by many people who stayed on the mountain slopes and lead peaceful lives. We think he looks great, and welcome this essential component of the Onyx Contact Force at long last! The Nexus Operative will be available from your Friendly Local Game Store and from Corvus Belli’s online shop on December 15.